Since 2002 there have been 54 shootings that had three or more victims that weren’t related to drug or gang activity, and which didn’t involve the suspect’s family or adversaries. Essentially, there were 54 shootings where a bad guy targeted random good guys and hurt more than three of them. Of those 54 shootings, 68% of them of them were in gun-free zones. You’re twice as likely to be a victim of a mass shooter in a “gun-free” zone. 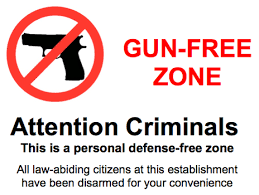 No matter how well-intentioned a gun-free zone is, as a country we need to admit that it the idea is failing us.